Team riders Andy Erickson, Taylor Sisson and Tony Rago make the day trip to race at Rosena Ranch in San Bernardino, CA on Saturday Feb 25th. 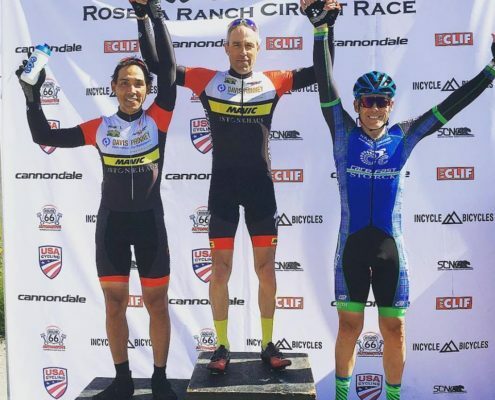 Andy and Taylor would line up with the Cat 3s and Tony would race the 45+ solo. The 45s went off first in a combined field with the 50+ as well making a total of 50 riders or so. All the usual suspects were there, lots of heavy hitters from So Cal. Tony’s plan was to get in a break earlier the better and see if we could stay away, this course was famous for breaks sticking. He was able to get into a break of 9 guys on lap 3 of 13, it was very organized and with everyone helping each other to push the gap – hard efforts and the way back had a solid headwind. We could see some strong riders organizing the chase and not too far behind at each turnaround. The gap grew but the group started getting tired and guys stopped working. This allowed 2 guys ride away from the break leaving it to 7 guys, they now had a decent gap but 3 riders in the break simply refused to put in any work. Tony recognized this but wanted to defend the gap that now looked to hold. He also knew those sitting in wanted that 3rd spot! Final lap and into the sprint Tony was able to hold them off and seal the 3rd place! 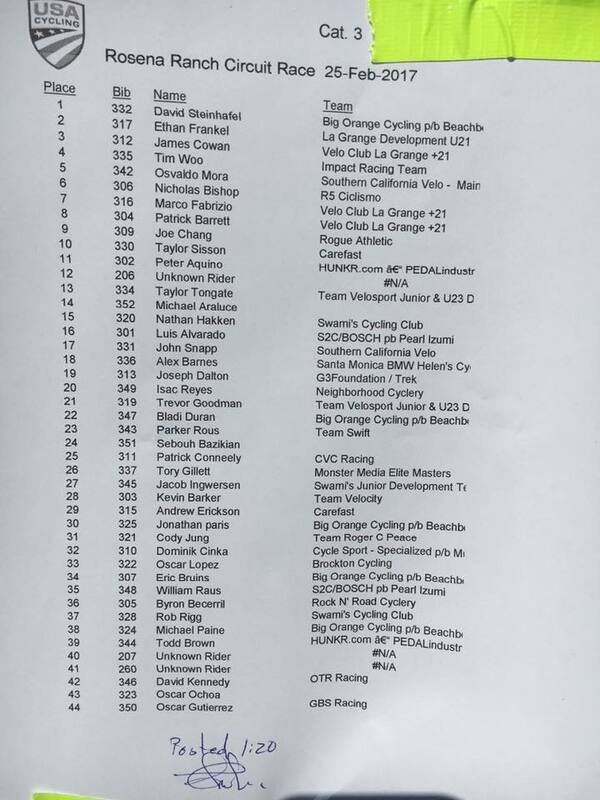 The Cat 3 group followed and Andy and Taylor lined up in the field of 44 riders. There were some big numbers from Big Orange and the La Grange guys. They figured it was their race and they would be chasing each other down. The plan was to keep the boys at the front so Andy would have the best chance at getting in a break. Andy was in multiple breaks that were brought back. The pace was pretty mild the entire time like everyone was just conserving energy to chase breaks and make it a group sprint finish. Last lap came and pace went hot. Taylor was able to hold on and finished in the top 10. Andy finished with the pack! 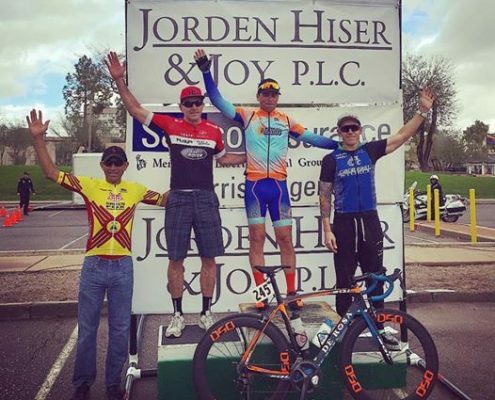 Valley of the Sun (VOS) is the first big stage race of the season and we had a skeleton crew headed down this year. 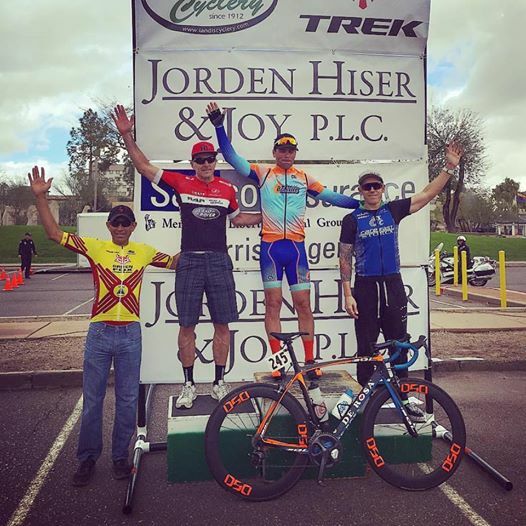 Tyler Chairsell, Scott Winzeler and Tony Rago made their way down to Phoenix, AZ and the surrounding areas for the three stages of the VOS. The weather forecast for the weekend was looking very grim, the boys were bracing for high winds and solid rain. The TT was on Friday and the weather held out, just a little breezy. 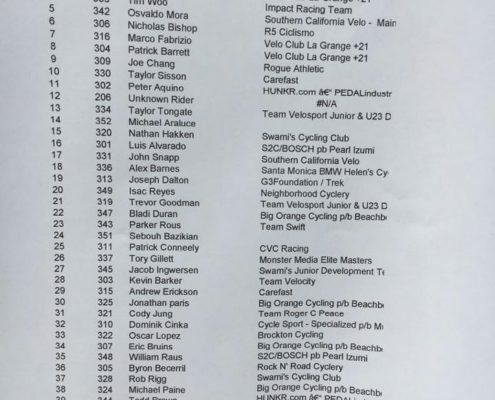 Tyler was racing in the Cat 3s and Scott and Tony would be racing in the 45+ field. Tyler posted a 33:50(31st) and Scott posted a 32:40(15th) while Tony would suffer a flat with 5k to go. The road race was where the weather really became a factor, high cross winds and solid rain. 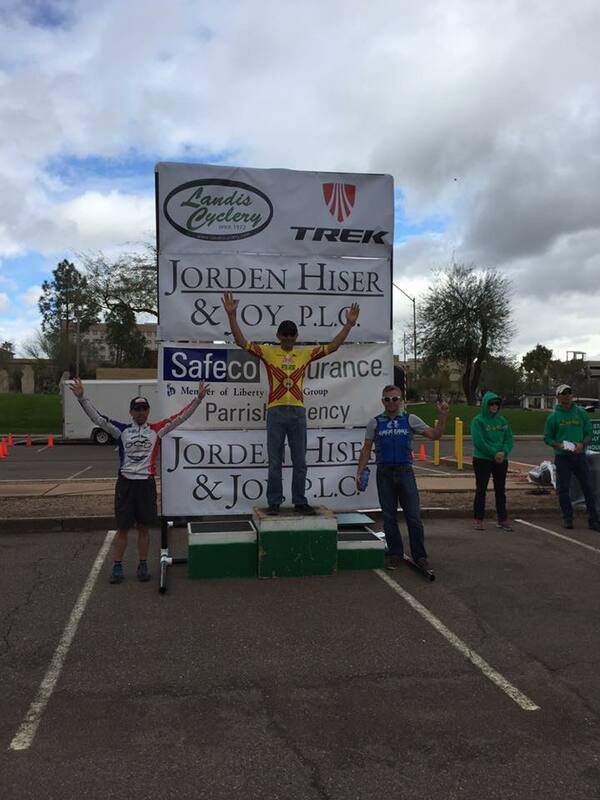 Tyler battled the Cat 3 field solo and became detached on one of the hard efforts up the climb that was on each lap. Scott and Tony maintain great position throughout the road race and Tony suffered yet another mechanical on the final lap before the group headed into the final climb. Scott was able to seal a 5th place finish in the road race moving him up in GC to 12th! 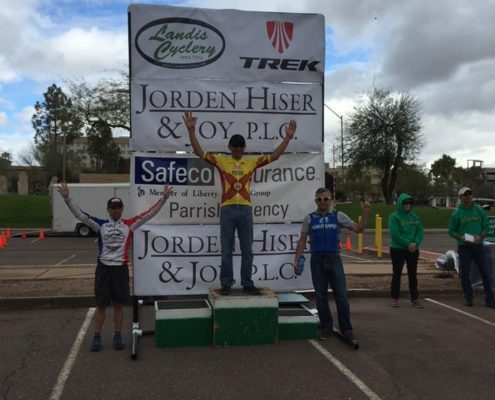 The final stage was the crit on Sunday in downtown Phoenix, the weather was still very wet with occasional light rain and the course soaked from continuous rain overnight. Tony had been dealt a pretty unlucky hand thus far but called on Scott to help him win the crit. Scott being the great teammate he is obliged and agreed to be Tony’s leadout to give him the best chance and a win or placement for some redemption. Scott raced a perfect race and kept him and Tony in the top 5 wheels or so from lap 5 on! With 2 laps to go the pace surged and they found themselves about 10th or so, Scott did his thing and got the boys back in position to make a move on the final lap. Last lap and on the back straight headed into the final corner, Scott put in a solid leadout to position Tony for the sprint. 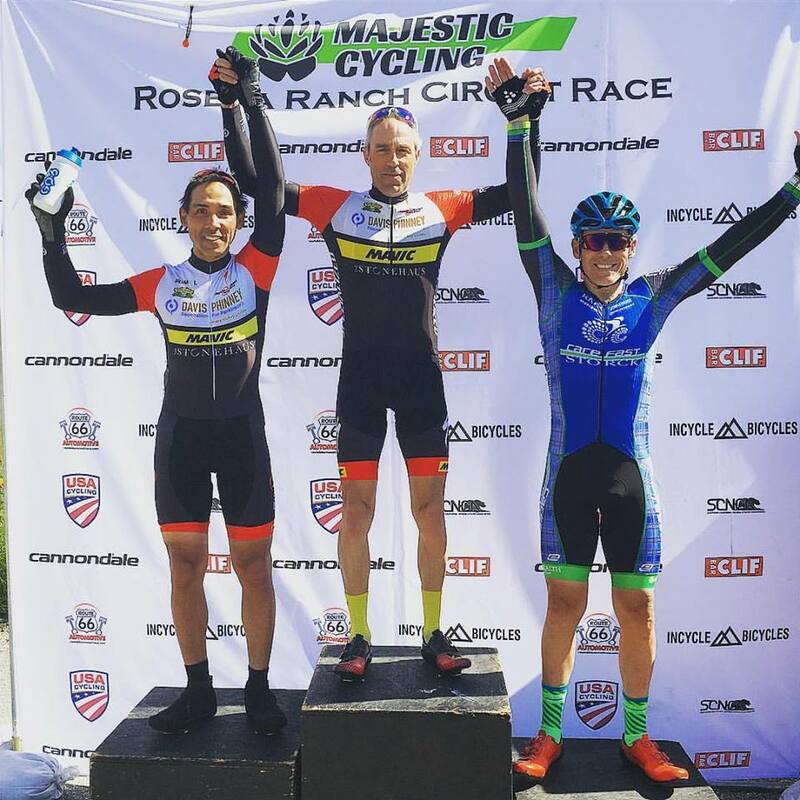 The field utilized our leadout and Tony was able to seal a 3rd place finish to close out a fairly unlucky weekend at VOS. Tyler would race in the 3s next and the course really dried out. Plenty of attacks and no real way to make moves left Tyler with a pack finish. The boys made the most of the weather and went into battled and made it home safe. Follow us on Facebook for race schedule and race results!